This page last revised November 29, 2015. Use coupon code SUN2015 during checkout. Sunday, November 29th 12:00AM CST thru 11:59PM CST ONLY. 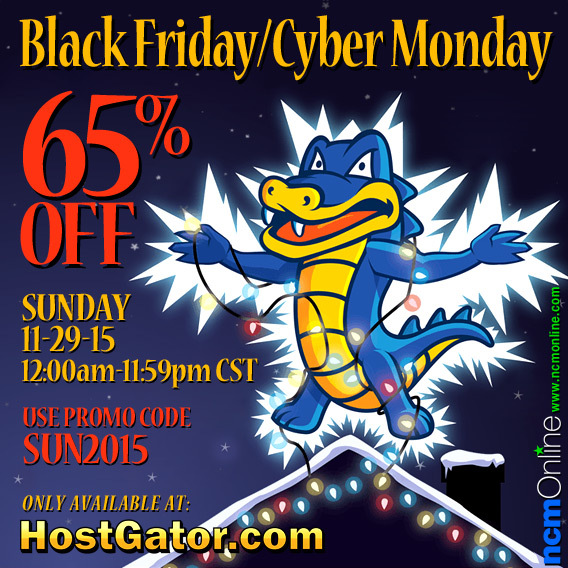 Take advantage of HostGator’ 65% Off Black Friday Cyber Monday Weekend 2015 Promo Code for Sunday, but remember, the sale lasts only 24 hours starting at 12 AM CST on SUNDAY, November 29th. This promotional discount code expires at midnight, so get to HostGator.com now to save big! Business: Designed for small business owners who require a secure, feature-rich, and economical hosting solution with e-commerce capabilities for an unlimited number of domains. Includes a private SSL certificate and one dedicated IP address. This top-of-the-line shared hosting plan is currently available at only $9.72 per month before Black Friday Cyber Monday discount. Baby: Designed for webmasters looking grow their online presence with a flexible, user-friendly, e-commerce-capable, and moderately priced hosting plan for an unlimited number of domains. Includes shared SSL certificate. Currently available at only $6.47 per month before Black Friday Cyber Monday discount. Hatchling: Designed for newbies looking for a basic, low-cost, and easy-to-use e-commerce-capable hosting plan for a single domain. Includes shared SSL certificate. This entry-level shared hosting plan is currently available at only $4.52 per month before Black Friday Cyber Monday discount. Discounted pricing valid for initial term only; all plans renew at regular rate. Offer ends 11/29/2015 at 11:59PM CST.